Recognized as a Green Hotel in the Green Mountain State, Killington Grand Hotel & Crown Club features easy access to skiing in the winter and exciting summer activities. Killington, Vermont is a beautiful location and offers amazing scenery along with the fresh mountain air of northern New England. Recognized as a Green Hotel in the Green Mountain State, Killington Grand Hotel & Crown Club features easy access to skiing in the winter and exciting summer activities. Killington, Vermont is a beautiful location and offers amazing scenery along with the fresh mountain air of northern New England. Whether you are visiting with family or friends, everyone will have a great time at this full-service mountainside resort. These Vermont timeshares for sale offer studio, one, two and three bedroom units and can sleep from two to ten guests comfortably. All Killington Grand Hotel & Crown Club units feature a full kitchen and at least one full bathroom with the larger units offering three full baths. Television, DVD player, and free Wi-Fi also create a comfortable atmosphere. Some units feature an outdoor living space with plenty of room for everyone in the group to enjoy some privacy. The entire resort is smoke free and has earned a Certificate of Excellence by Trip Advisor. 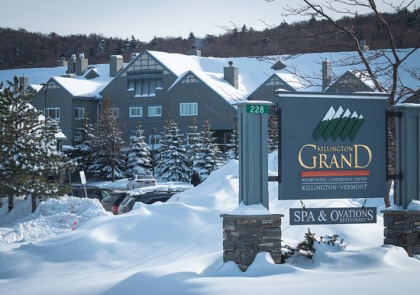 On-site amenities include a year-round heated outdoor swimming pool with two hot tubs, health club featuring weight and cardio equipment and Killington Grand Spa offering relaxing spa treatments and warm stone massages. When you are ready for a bite to eat, you won’t want to miss Preston’s Restaurant with bar and light entrees, or Grand Café featuring sandwiches, pastries, and Starbucks coffee. Both restaurants are open seasonally. During the winter, the convenient ski-bridge access to the slopes offers hours of fun enjoying skiing and snowboarding. During the summer, golfers will enjoy Killington’s 18-hole championship golf course - the perfect activity for a beautiful summer morning. High quality accommodations and breathtaking views are just a few of the reasons to check out the amazing Vermont timeshares for sale offered by Killington Grand Hotel & Crown Club. Visiting the iconic village of Woodstock, Ben and Jerry’s Ice Cream Factory or one of the many shops and museums will provide entertainment for the entire group. If you are looking for a memory-filled vacation with family and friends, Vermont will not disappoint. Contact Killington Grand Hotel & Crown Club Specialist Today! Days: Friday / Time: 5:30 P.M.